Are you back in the swing of things today? We are, and I have to say it feels good to have a routine again. I'm always looking for inspiration and new ways/ideas to teach my children. The current Carnival of Homeschooling is available. 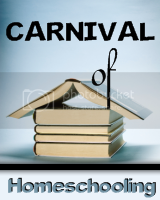 Click here to visit the carnival and read homeschool articles by many wonderful bloggers. It's a great resource!